Seven years ago, Greg Taylor was freed from prison after spending over seventeen years in prison for a murder he did not commit. Had it not been for the efforts of a determined lawyer, Chris Mumma of the N.C. Center on Actual Innocence, Taylor might have lived out his days in prison. The Center, and later the N.C. Innocence Inquiry Commission, took up his case, which became the subject of a 90-minute film by Winston-Salem filmmaker Gregg Jamback. The production, “In Pursuit of Justice: How Criminal Justice Reform in N.C. 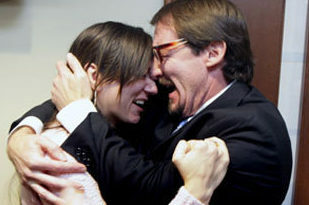 Freed Greg Taylor,” was screened Wednesday night during The News & Observer’s second Community Voices forum with ABC11. The film includes interviews with Taylor and his relatives, Mumma and others from before his exoneration, along with footage from Taylor’s trial.